Lebo Mothiba grabbed a vital brace in France last night, meaning that a Bafana Bafana international will definitely win the Coupe de la Ligue title in March. 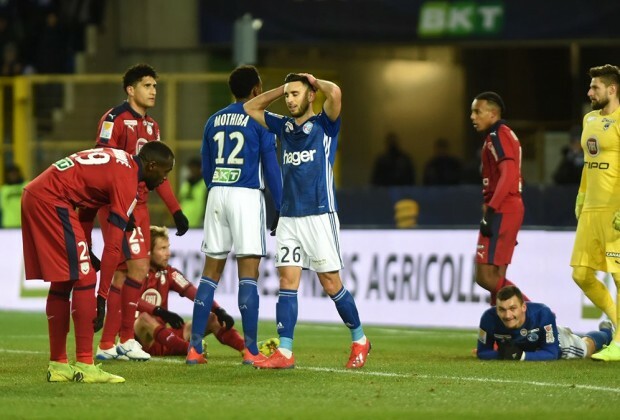 Lebo Phiri stepped up to the spot in EA Guingamp’s penalty shootout last night to hit home a finish that Mothiba himself would be proud of, and the striker followed suit by bagging his ninth and tenth goals of the season to make sure Strasbourg joined EAG in the final. Like his compatriot on Tuesday, Mothiba’s side had to come from behind as they fought back against Bordeaux, and two second half goals from Mothiba saw them win 3-2 to book their spot in a French cup final for the first time since 2005. The result means that the two Lebos will go up against each other on March 30 at Stade Pierre-Mauroy – the stadium of Mothiba’s former club, Lille OSC – and that one of them will most definitely get their hands on their first trophy in France. Seeing two South Africans going head to head in a cup final in one of Europe’s major leagues is not a common occurrence, and – as he considers his next Bafana squad – Stuart Baxter will be delighted to see the role that the duo have played for their clubs in reaching the showpiece. Who do you think will lift the Coupe de la Ligue title?